BERLIN -- A historic attempt to land a spacecraft on a comet was set in motion Wednesday by scientists at the European Space Agency, despite a last-minute problem with the landing system. It was the climax of a decade-long mission to study a 2.5 mile wide lump of dust and ice known as 67P/Churyumov-Gerasimenko. It marked the end of the decade-long, 4 billion-mile journey that Rosetta and its sidekick craft Philae traveled together to reach the comet. ESA announced late Tuesday that the active descent system, which uses thrust to prevent the craft from bouncing off the surface, could not be activated. Instead, the agency is relying on ice screws and a harpoon system to secure the lander. "The cold gas thruster on top of the lander does not appear to be working so we will have to rely fully on the harpoons at touchdown," said Stephan Ulamec, Philae Lander Manager at the DLR German Aerospace Center. "We'll need some luck not to land on a boulder or a steep slope." The washing machine-sized lander separated from Rosetta at 3:35 a.m EST to drift down to the comet, where it was to latch on using harpoons and screws. Confirmation of the separation came about a half-hour later. During the descent, scientists were powerless to do anything but watch, because the vast distance to Earth - 311 million miles - makes it impossible to send instructions in real time. Confirmation of a landing, if successful, should reach Earth by about 11:03 a.m. EST. The plan is that Rosetta and Philae will then accompany the comet as it hurtles toward the sun and becomes increasingly active as it heats up. Using 21 different instruments they will collect data that scientists hope will help explain the origins of comets and other celestial bodies. The European Space Agency says that even if the landing doesn't succeed, the $1.62 billion mission launched in 2004 won't be a failure. 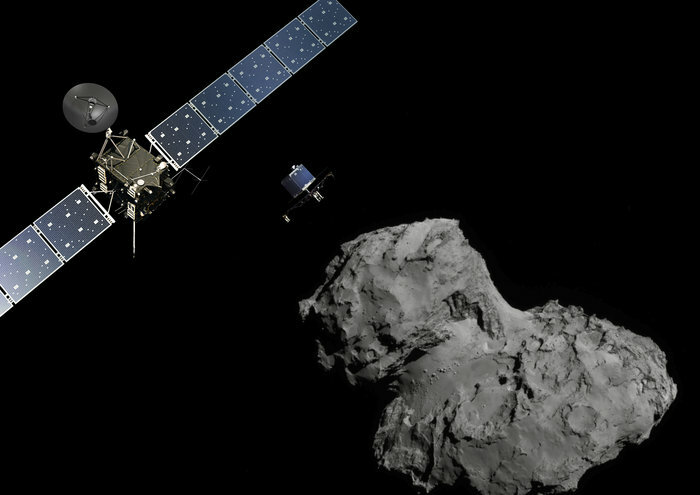 Rosetta will be able to perform 80 percent of the mission on its own.